Poor sales in its native Japan meant that the console would only survive for around three years. But in those three years, the SG-1000 led quite the charmed life. It was redesigned only a year after release (the SG-1000 II), with a new casing and everything. It strangely saw an almost immediate release in Australasia, the beginnings of a relationship which would see Australia and New Zealand become perhaps Sega’s most loyal Western market throughout the 80s and early 90s. 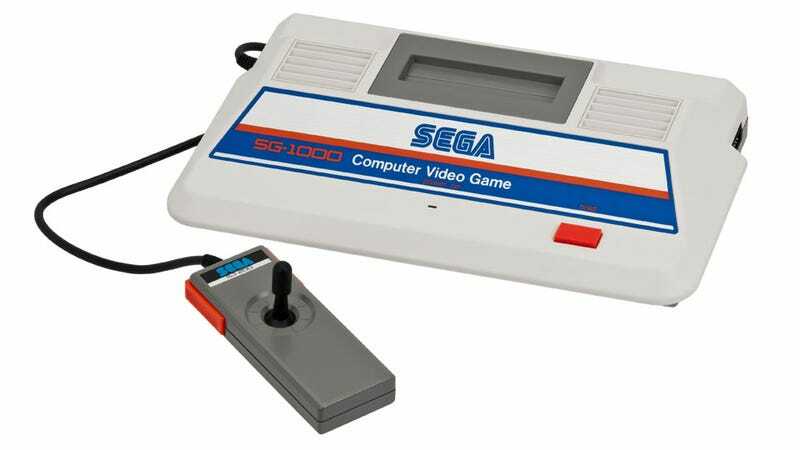 While all this makes it sound like the SG-1000 was a bit of a misfire, it was still important in the development of Sega’s home console business. The system’s card slots were later used by the first edition of the more popular Sega Master System (as we saw last week), and indeed, a planned third iteration of the SG-1000 (the Sega Mark III, below, probably my favourite console design of all time) was transformed mid-development to become the Master System itself. You won’t find too many memorable series making their debuts on the SG-1000. There was no primitive, early edition of Alex Kidd, or Shinobi, or any other early Sega hero. Most games were arcade hits or clones of arcade hits, like Zaxxon and Space Invaders, though there was also a version of Sega’s own Monaco GP available. If you’re looking to get one for your collection, an official SG-1000 is fairly rare, though if you ever do get pick one up games are pretty easy to get hold of for $10-15 each. Total Recall is a look back at the history of video games through their characters, franchises, developers and trends. This post originally appeared on February 27, 2012.